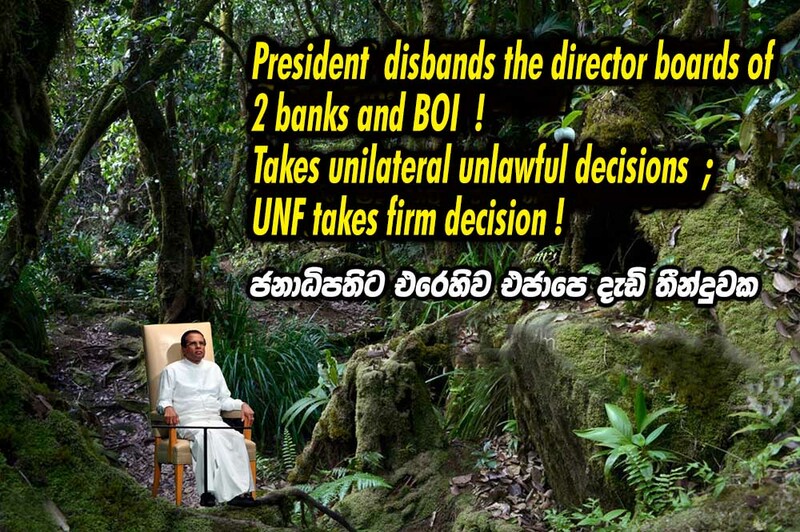 LEN - www.lankaenews.com | President disbands the director boards of 2 banks and BOI !Takes unilateral unlawful decisions ; UNF takes firm decision ! (Lanka e News 18.Oct.2018, 11.00PM) President Pallewatte Gamaralage Maithripala Yapa Sirisena who was made the president of the country by the Swan party , led by the UNF has brazenly and most unashamedly broken his promises and undertakings by unilaterally and unlawfully letting down the consensual government . Even without the knowledge of the ministers in charge ,he has ordered to disband the boards of directors including chairpersons of Bank of Ceylon , Peoples bank and the Board of investment with effect from 17 th midnight . The minister in charge of the two banks is Lakshman Kiriella , and the minister rin charge of the Board of Investments is Malik Samarawickrema. The two ministers answering queries posed by Lanka e news said , they are totally in the dark about these moves. It is significant to note the president has no legal powers to appoint or disband the board of directors including the chairpersons of the two banks .Under the Banking ACT governing the establishment of banks , it is only the ministers in charge who are vested with those powers meaning that the president has acted absolutely unlawfully , and his orders are illegal. The excuse cited by president for his illegal action is ,that there is corruption in those Institutions. On the contrary , not one such complaint has been received by the relevant authorities against those Institutions . It is only just the uproar created by the pro president media . The UNP leaders are of the view this outrageous illegal action of the president based on a unilateral decision of his should not be treated lightly . Thefts and plunders of president’s family seep out ! For some time , the president has been trying to parade as a paragon of virtue while portraying that the UNF constituent party was corrupt , and leveling accusations against the UNF. Now , according to reports reaching Lanka e news the UNF has arrived at a firm decision to end the corrupt and bungling era of the president during which short term of three years , the president , his entire family including his wheeler dealer son in law, daughter , son and relatives plundered public funds , public assets and robbed the country on a monumental scale. As there is copious and cogent evidence to prove this , the UNF has decided to halt further devastation of the country by the president . The president, the greatest masquerader of all times who after committing all the vices and cardinal sins pretends that he is a patriot will be receiving the right answer within the not too distant period. Measures are also to be taken against president’s illegal moves and activities , it is learnt .